Adopt an animal with the Aspinall Foundation and you will be helping to protect endangered animals around the world. There are 4 packages which range from £3.50 – £15.00 a month. The Aspinall Foundation was first set up as a charity in 1984 by John Aspinall to help protect rare and endangered animals. The charity now runs two wildlife reserves in the UK with their Howletts and Port Lympne parks, plus a number of conservation projects overseas. These overseas projects can be found as far away as the Republic of Congo, Gabon, Indonesia and Madagascar. The Foundation works on educational initiatives within local communities to support their ongoing conservation activities. When you show your support by adopting an animal, you be helping to provide funds to run their two UK conservation parks and help fund their groundbreaking overseas work. Thanks to kind donations from people like you, the Aspinall Foundation are able to make a real difference to endangered animals, and those that may become endangered in the future. Supporting the work of the Aspinall Foundation is really easy with udopt. There’s an amazing selection of animals to choose from, making it possible to help the Foundation both at home and abroad. includes a FREE Passport – which gives you unlimited entry to one of their animal parks. Choose from Port Lympne or Howletts Wild Animal Parks. includes an Aspinall A Card which gives you unlimited FREE entry to both Animal Parks. includes 2 x Aspinall A Card which gives you unlimited FREE entry to both Animal Parks. includes 2 x Aspinall A Card which gives you unlimited FREE entry to both Animal Parks plus a and a One Hour Keeper Experience for One Person. The Aspinall Foundation cares for hundreds of animals at their wildlife reserves in the UK, as well as the many different schemes abroad. Your donation will bring a smile to animal lovers in the UK. You will be able to see the fruits of your donation in evidence in the parks run by the foundation, as well as those overseas. This funding is particularly important as they may not have the financial resources to help support their local wildlife. The Aspinall family first opened their doors to the public in 1976 to see their private collection of animals. They have since gone on to become one of the world’s leading experts in caring for endangered animals at their UK based parks. Their commitment to saving the world’s animals is second to none, and thanks to their groundbreaking work all over the world many species have already been protected from slipping into extinction. Your donation goes to help parks found in the UK and one of the UK’s most recognised endangered animals foundations. The Aspinall Foundation has successfully returned western lowland gorillas and black rhinos back into protected areas of the wild. You donation supports a foundation with a proven track record in protecting and breeding animals, and then releasing them into the wild. Every charitable organisation has milestones and goals to shout about, and here are five of the Aspinall Foundation’s most important. 1920’s : Animal lover John Aspinall is born in Delhi, India on June 11th 1926. 1950’s : John Aspinall buys Howletts in 1957 as a family home to allow more room for their growing menagerie of animals that included a monkey, a tiger and two bears! 1970’s : Also in 1975, the Aspinall Foundation had their very first Western Lowland Gorilla baby. Since then, another 129 babies have been birthed through the Foundation, a magnificent achievement. 1980’s : 1984 see’s the Aspinall Foundation registered as a charity. 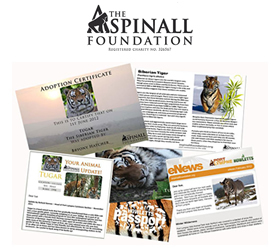 For fellow udopters wishing to learn more about the work of the Aspinall Foundation, the following section lists some of their flagship publications in PDF format.